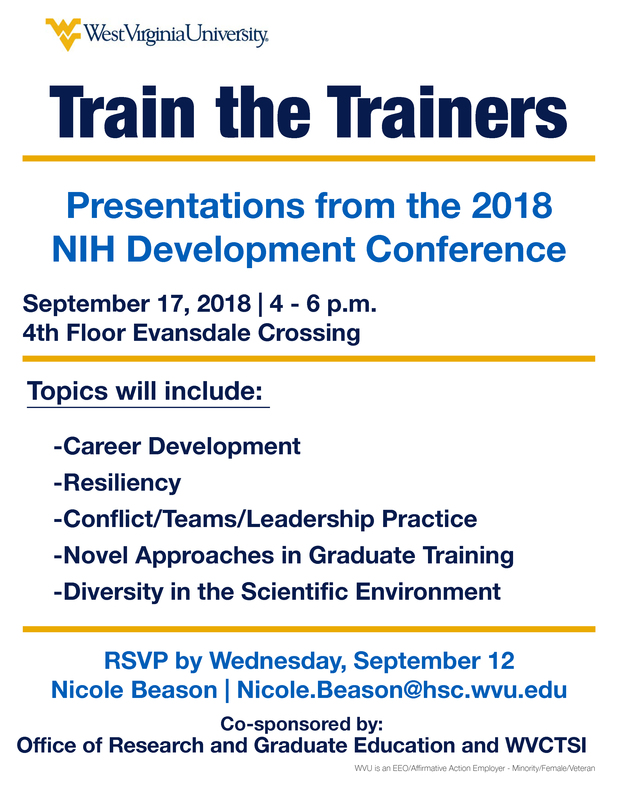 WVCTSI and the WVU Office of Research and Graduate Education are hosting a Train the Trainers event highlighting presentations from the 2018 National Institutes of Health Development Conference. This event will cover topics including career development, resiliency, conflict/teams/leadership practice, novel approaches in graduate training, and diversity in the scientific environment. This event will take place Monday, September 17 from 4 to 6 p.m. on the fourth floor of the WVU Evansdale Crossing Building. Please RSVP to Nicole Beason at nicole.beason@hsc.wvu.edu by Wednesday, September 12. WVCTSI Administrative Offices are located in Room G130 of the Erma Byrd Biomedical Research Facility of the West Virginia University Health Sciences Center.